The Wolli Creek Valley is an ideal natural play space for children and a great outdoor classroom for school groups. The area is within walking distance for local residents and is easily accessible by public transport and car. Walking tracks have easy grades suitable for children and sample risk assessment information is available. There are picnic facilities at Girrahween Park. Turrella Reserve has a playground and large open space for play or nature observation. The Two Valley Trail Education Resource – Over 100 pages of teachers resources related to the Two Valley Trail are available via this website. These teachers’ notes for various Valley walks and activity sheets for students are also available for download. Print copies are available from the Society. The Birds Nest Resource – The Bird’s Nest is an A3 sized folder that can be borrowed from the Society. This website provides an overview of the contents to help you plan how you will use the resource in your studies. You are welcome to use any of the materials directly from the website with acknowledgement. This award for primary school children aims to encourage children’s understanding of the natural environment using the Wolli Creek Valley as a resource. Groups of children from primary schools and community groups are eligible to enter.Entries for the Award close on 30 September each year. If you are teacher or the parent of a primary school child or are otherwise involved with a local school, please encourage your school to participate. Contact info@wollicreek.org.au to discuss your project and discuss possible eligibility for prize money. Australian Museum www.amonline.net.au – wide range of environmental information for kids. Birds in Backyards www.birdsinbackyards.net – practical information on urban birds. Project linked to the Australian Museum. CSIRO www.csiro.au – An excellent website packed with science. Frog and Tadpole Study Group www.fats.org.au – fun website with all you’ve ever wanted to know about frogs, including the Frogmobile. National Parks and Wildlife Service www.nationalparks.nsw.gov.au – packed with useful information with special section for kids aged 5-12 years. Royal Botanic Gardens www.rbgsyd.nsw.gov.au – school excursions, holiday activities and outreach programs. 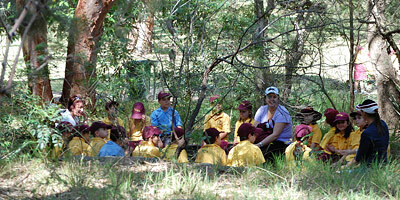 Streamwatch www.streamwatch.org.au – details of community environmental education projects for schools. Taronga & Western Plains Zoos www.zoo.nsw.gov.au – Info packed including Backyard to the Bush, visits and outreach programs. Waterwatch NSW – www.waterwatch.nsw.gov.au – all about the waterwatch program and how to get involved.